Achieve a state of deep relaxation in seconds with the primordial vibrations of “Om”. Physically tune your body to the Om vibration and enter a state of balanced wholeness ideal for healing and higher consciousness. Helps center the body and mind when placed on the rib heads, thoracic vertebra, sternum, sacrum and illiums. Helps meditators and yoga practitioners achieve desired states effortlessly. The rishies or spiritual master of India believed that the musical tone sadja or sa, which means the father of all others, to be the musical sound which resonates with the never ending primordial vibration om. The rishies arrived at sa through deep meditation. To this day, Indian musicians approach tuning their instruments as a meditation to set the Spiritual tone for a whole concert. The effect of India’s meditative music is based on a musician’s ability to tune to sa. The Swiss scientist Hans Cousto, author of the Cosmic Octave, discovered how to convert planetary cycles into musical pitches. Using his system the sa corresponds to the sound of one Earth year of the time it takes the earth to circle the Sun. To arrive at the frequency of 136.1 Hz, an earth year is reduced to a second (frequencies are measured in cycles per second). An earth year is 365.242 days and an earth day is 86,400 seconds. When the days are multiplies by seconds the answer will be 315,567,925.9747 seconds equal one earth year. To arrive at an audible sound, 315,567,925.9747 seconds are divided into one (year) and then raised 32 octaves. The result will be the audible tone of answer 32 times the result will be 136.1 Hz. The cosmic note OM. 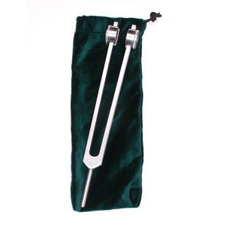 Hold your Om tuning fork by the stem between your thumb and first finger. Do not apply a lot of pressure. Gently tap the weights on your knees, tapping pad, or palm of your hands. This will set the weights in motion and create a clear, deep and sustained tone. Bring the double-pronged side of the OM fork about an inch from your ear(s) and adjust the distance for volume. Also, for an in-depth look at Mantras, check out John Beaulieu’s Bija Mantras and Chanting video.